This weekend the World Cup in Russia will end with two final games. It has been an amazing tournament. A tournament full of surprises and a lot of VAR decisions. And will the tournament end with a surprise? In the Finals are Croatia and France. France isn’t a big surprise but Croatia is a big surprise for a lot of people. We already predicted that Croatia would come to the finals. Now it is time to look back at the world cup till now and give our predictions for the last two games of the World Cup. This last weekend of the tournament there are two matches scheduled. In St Petersburg Belgium and England will compete for 3rd place. This game is played on Saturday 14th of July and starts at 16:00 CET. The other game, The Final, is played on Sunday 15th of July in Moscow. This match starts at 17:00 CET and France will play against surprising Croatia. What happened at the World Cup before the finals? At the start of this World Cup there where a few top favorites. The top favorites at the start where Brazil, France, Germany and Spain. Only France did what they had to do. They managed to reach the semi finals and the finals. Germany had the worst World Cup in years. They where eliminated from the group stage. They lost 2-0 against South Korea and 2-0 against Mexico. A very surprising elimination for the current World Champions. Spain did manage to reach the second round but in that round they lost a penalty shoot out against the hosts Russia. This was not what Spain and their nation expected from their team. Brazil managed to reach the last 8 but in that game they lost against Belgium. An amazing game between two favorites but Belgium was the better team and sent home Brazil. The only top favorite left in the semi finals was France. France isn’t playing a good World Cup. They play very defensive football and against Belgium they didn’t attack at all. Belgium was the much better team but France managed to score from a corner kick. Umtiti scored a briljant header from the corner. 1-0 France was enoygh to seal this game. Loads of critics where bombed over the France squad. But at the end results are the only thing that count at World Cups. England wasn’t one of the favorites but they played a very decent World Cup. They where in a group with relative easy opponents. And they won 2 out of their 3 games. In the second round they beat Colombia after a penalty shoot out. And Sweden couldn’t give England a game in the quarter finals. England beat Sweden 2-0 and managed to get in to the semi finals. This already was a big surprise for all critics and media in England. But after winning against Sweden everybody thought they would beat Croatia. Croatia had already played 2 extra time and penalty games. They should have been tired but in the second half against England they played amazing football. 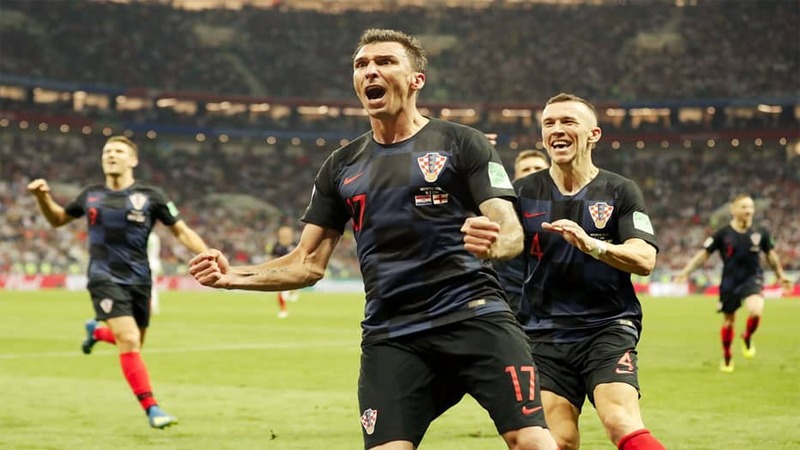 A late Mandzukic goal in extra time sealed a 2-1 victory for Croatia. If you haven’t bet on any of the games yet, it is time to do now. We selected the best betting tips a bit further down this page. And we settled some amazing deals with online betting websites. Online you find hundreds of websites where you can bet on the World cup in Russia. But not all of them are 100% safe and reliable. Some of them offer low odds and have unreliable bonus terms and conditions. We only want you to bet at reliable websites. That is why we selected a few good bookmakers. In the table below you find our preferred betting partners. At these websites you find reliable bonus terms and the best odds on the World Cup. As you can see there are interesting welcome bonuses available at every betting partner. Check out what kind of bonus you like and join the bookmaker of your choice. Registration is free at every online betting website. Click the play button when you want to try a few bets at a betting partner. Now it is time to give you our predictions for the two final matches at this World Cup. And I will also give you an overview of the best betting tips for each game. With the predictions and the betting tips you can increase your winning chances. Of course you can use our tips and predictions for betting. But keep notice that we never guarantee you any winnings. We know a lot but it is still hard to predict these kind of matches and results. In Moscow france hosts Croatia in what is going to be an epic World Cup Final. When we look at our preferred betting partners we see that France is top favorites to win this final. You will get 1.90 times your bet amount when you bet on france to win in 90min. france is favorite because they have the better squad. and the France didn’t have to play any extra time this tournament. If we look at Croatia, they played 1 extra game this tournament because they played 3x 39 minutes extra time (90 minutes extra). Normally players will get more and more tired. But maybe this place in the finals can just give the Croatian players an extra last boost. They need an extra boost because France has a few super dangerous strikers. Mbappe is super fast. How is Lovren going to cope with him? But I personally would love to see Croatia win this World Cup. They probably have the best midfield of the tournament. They have Modric, Rakitic and Perisic. All three of the players gave their best in the second half against England. And they made the difference together with Mandzukic. when these 4 players can stand up one more time I think they can get a result. I predict another though game. france will play from defence and Croatia has to try to break the defending wall of France. When croatia keeps it together at defence this game can get in to extra time (again). I predict 0-0 or 1-1 after 90 minutes. And France to win in extra time. When croatia manage to get it to a penalty shoot out they will win! The match for 3rd place is always a strange game because both teams where focused on reaching the finals. Normally there is one team in this match that only wanted to be world champions. That team normally loses this game because their motivation is gone after losing the semi finals. But in this case I think England would be very happy to win third place. Belgium is still down from their game against France. But I do think Belgium also wants to get the best out of this game. In the group stage both teams played against each other. In that game both teams wanted to lose because they wanted to end 2nd in their group. Belgium won the game and ended first in the group. England was second and they avoid playing Brazil and France. In their semi finals England played extra time and this could just be the difference in this game. I think Belgium has the better squad but England probably has a bit more motivation to win this game. Both teams will attack and it is going to be an open game with a lot of chances and goals. I predict Belgium to win 3-1 or 3-2. this is the only chance for Lukaku and Harry Kane to be topscorer. they can both win a price when they manage to score a few goals.